I continue to make progress in the ongoing effort (now over 30,000 words for the first 3 moons) to create a systematic approach to Druidic occult training. The first three Moons are, of course concerned with very basics. As I did when I re-outlined the Dedicant material a couple of years ago, I am attempting to begin at the beginning, writing for students who don't have years of familiarity with Pagan, Wiccan or occult ideas. The good news is that nearly everything we think of as 'occult' has solid basis in ancient Pagan ideas. The bad news is that expressing them without recourse top 20th century occult jargon doesn't speed up the process any. • The Shielding – A Spell to Bless a Talisman of Protection. 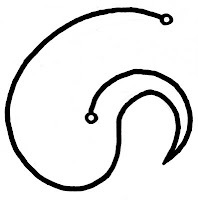 On this symbol you will prepare a small vessel for fire, in which you will kindle charcoal at the right moment, or scoop a few coals from your main fire into the vessel. Be you cleansed of every impurity, whole and holy for the work. Be you blessed in Land and Sea and Sky, fit for the work of the wise. Hear me, my kin, my allies, my elders, I pray, and make your wisdom open to me, your love flow with mine, your power strong in me, that I may do the work of the Wise. Be beside me, Mighty, Noble and Shining Ones, and give your blessing to this (object), that it may be a shield of protection for me in my magic and my life, for I am (your name and lineage), your true worshipper! In the Mother’s Love be welcome. In the Joys of Life be welcome. In this Sacred Grove be welcome. 3: Take an omen to be certain the work is proper. As a gift calls for a gift. And let this be a work of Blessing. That will flow and shine in this talisman. I open my heart to the flow of your blessing, I, your child and worshipper. Let the spell be worked true! 6: Light the charcoal or incense in the censer or bring out the coals from the main Fire. As you kindle or prep this fire, you place three good pinches of consecration incense on the coals, again repeating the three conjuring words. by Fire and Shadow bring the Warding forth! let strength and light and shadow join as one. make now my shield, my warding, be it done. I call to you, O being of (substance or form) and bid you to be welcome at this Fire of the Wise. By this blessing I bless you, make you sacred, set you to serve at the Fire of the Gods. Be you fit by this blessing for your work, to protect my body and my being from danger and ill, whether by land or sea or sky, whether by day or night, in summer or winter. Let no sprite or spirit, goblin or troll, and no ill-wish of mortal or spirit harm me, and let all beings open my way with favor. Let the Waters be deep in you and the Fire be bright, that you may serve in the work of the Wise. Let this by my shielding, and so let it be! 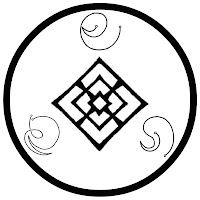 9: Recenter, find you peace, and end the rite in the usual way, thanking all beings and closing the Gate. Not that I distrust you at all (I respect you greatly as a leader and scholar), but I'm curious - where are those symbols from? I've never seen them before. he heh... They are unique to the system I've been building. They are made by connecting the letters on the diagram from the Book of Ballymote called Fionn's Window. 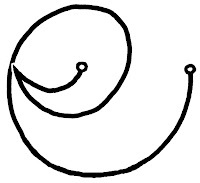 One might choose to connect the letters with straight lines, but using curves along the circular arrangement of the "Window" produces these rather La Tene figures. 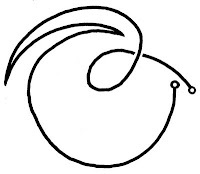 In this way any Irish word or name can be rendered into a sigil. Being an occult kook of sorts I dig this sort of mystification, and was delighted to come up with this method. The sigils in the spell are from the three conjuring words used later - feel free to figure out which is which ;). And asking a question is never disrespectful in itself - ask away!